From Sunday June 18th to Wednesday June 21st, a group of eighteen people from the Mara were part of a community training visit conducted in Lion Guardians areas of operation and on the model of community conservation that we pioneered. The group was composed of opinion leaders and representatives of various conservation organizations based in the Maasai Mara such as KWCA, Friends of Mara and MMWCA among others. 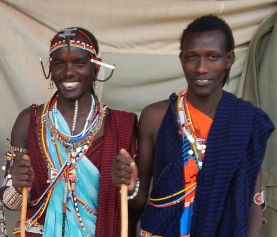 The exchange visit which was facilitated by Nature Kenya was focused on learning from the proven community conservation model of Lion Guardians as well as gathering insight regarding conservation from the communities that Lion Guardians has been working with. The visitors arrived to Amboseli on the afternoon of 18th June and were briefed by our Program Manager, Luke Maamai, who took them through the Lion Guardians model. 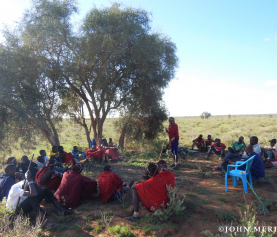 On the following day, the group had a morning talk with Meiterienanka Saitoti who is one of our senior-most Guardians in Eselenkei Group Ranch. Immediately after the talk, the group visited the Big Life scout camp at Osewan to learn how we work together and complement each other’s efforts. After the Osewan camp visit, they went straight to Ilkiponi Leremit manyatta (where preparation for the meat eating ceremony is ongoing). At the manyatta, the group was received by Olgulului Group Ranch Treasurer and many community members. There were songs and ululations as the hospitable residents welcomed the visitors. Here, the visitors learned how the Group Ranch leadership and communities in Amboseli have been supportive of conservation. The Treasurer also noted the various benefits accrued as a result of conservation; key among them is the employment of local people by conservation organization such as Lion Guardians and Big Life. The group also received lessons on strong cultural aspects that still exist on this side of Maa Land. They established that there have been ongoing ceremonies by Ilkiponi age-set in order to graduate from Morans to become elders. The ceremony is known in Maa as Olng’esher. In the evening, the office manager, John Merishi, and biologist-in-training Jeremiah joined the team at Lormong’i and took them to the conservancy where they had the good fortune of seeing Selenkay’s pride of nine lions. There excitement grew to fever pitch as the group watched the pride hunt and kill a bull zebra. The first day was indeed a bee-hive of activity! On the second day, the program and office manager took the visiting group to the conservancy where they met some of our Guardians from Eselenkei. 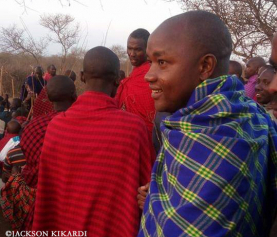 The Guardians namely, Kikanai, Lekundu, Leparakuo, Sunte and Lekutuk, took the group on a walk within the conservancy. During the walk, the Guardians showed the team how they use radio telemetry to monitor collared lions within their zones. 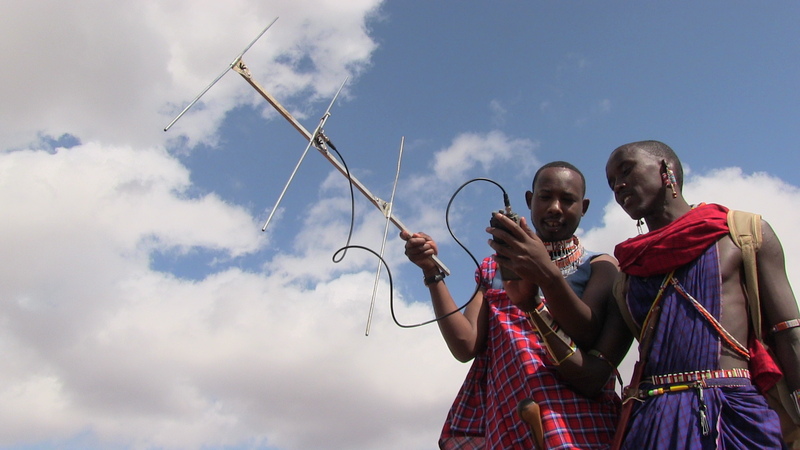 The Guardians picked up Noldupai’s signal towards Oldepe near Porini’s mobile camp. The teams observed tracks of various wild animals. It was also a good bird watching session. After the session with the Guardians, the team went to Ilkiponi Enkii Manyatta. At the manyatta, the group was received by residents who turned up in large numbers. Similar to the events that happened at Leremit Manyatta, the visitors were welcomed with songs and dance. Then the Eselenkei Group Ranch Treasurer addressed the audience on issues concerning conservation. He also reiterated the cordial working relationship between the Eselenkei group ranch leadership and the various conservation organizations in Amboseli. He praised Lion Guardians for their commitment in conflict mitigation. At the end of the three days visit, there was a short debrief session with the visitors who expressed their happiness at having been able to be part of the community visit. They said that they were impressed with how well the Lion Guardians model is integrated within the cultural values and traditions of the local communities. They further observed how the strong cultural values has enabled people (the old and young) to be respectful. They also thanked Chief Joseph Lekanayia from Lenkisim, for accompanying them throughout their community visit. Many stated their plans to come back to Amboseli in the near future. The team at Lion Guardians was extremely happy to have hosted this experience for the group from the Mara and we wish them all the best in their efforts.